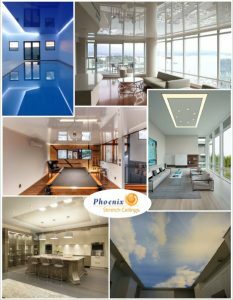 We are proud to announce our 5th anniversary with Phoenix Stretch Ceilings and LED lighting solutions! Without the loyalty of our valuable customers this would not have been possible and to express our gratitude we are offering a GIVEAWAY of $1000 per year we’ve been in business! That’s right! $5000 to use towards your own Stretch Ceiling project or beautiful custom light feature! Check our Facebook Contest for further details about how to participate. Below a collage of various Stretch Ceiling projects we created for you – hope you like it! We look forward to working with you on other exciting projects in the future. Just contact us directly if you prefer a guided tour, to make sure we are available to answer all specific questions you might have.